forces to wipe out terror." ; Muriel Levitt... page 7 ? sent to the Soviet authorities. with those of other countries. ticles published in the West. ference "is the only approach"
Chanukah to nursing and retirement home residents. Lighting the menorah will cap off the celebration. Women's Division President Mollie Fitterman. Lester Sodowick. Barbara Sommers, and Robin Weinberger. to be no immediate threat. Adult Division Director, at the Federation office, 832-2120. Visits To Kibbutzim And Israeli Military Bases. Director of Communication* at the Federation office, 832-2120.
is to expel Arabs from Israel. tion. There is a vitality there. natural for Dr. Jerome W.
clusively Jewish in its victual offerings. the availability of a cheeseburger. prised of 'only' 60 percent Jewish students. the perceived onslaught of assimilation. should provide that the conflict is ongoing. frontation in the Middle East. Combining "Out Vexca and "Fadafalion flaportar"
Christ as the God of the land,"
rights and freedom to all." Catholics in the 16th Century. 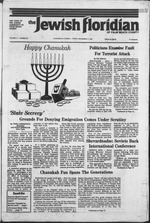 let us kindle the lights for Soviet Jew s.
through our TJA Federation Campaign. w ill help insure a bright Jew ish future. of the University of Miami, and Steven Silberfarb of ? American Israel Public Affairs Committee, are Mrs. ? Green's special guests. They recently appeared together at ? the Jewish Federation of Palm Beach County's Mideast ? tion Executive Director Jeffrey L. Klein. honorable mention for several invitationi. show features Jewish music, comedy, and ncw.i. | Na'amat USA-Golda Meir, Luncheon/Show Golden ? S KU^nufahSnti? f Federation, Women's Division, Campaign Cabinet I ^^"If Rn' }nVite k*"
I Tikvah, Regency Spa through De7l7 Na'amat USA- J "^aL*t TP*"
| Theodore Herri, board, 10 a.m. Jewish Community Day I SSS^JSLS w6 *"
| School, Executive Committee, 7:45 p.m. Women's I so'lc,.ta^on at breakfast. I Home, 4:30 p.m. f speaker. Mr. Gross announced. ; Federation, Poinciana, Educational Meeting. 3:30 p.m. I "rael and the United States"
Hadassah-Chai, noon Federation, CLAL Program, building. 8-9:30 a.m., 12-2 p.m., 4-6 p.m. Jewish Community Day 5 The first Kirkoatripk far,. tion, according to Mr. Gross. South, it's not just for a meal. into broiled fish and chicken. solutely no time at all. to put away your toys." mother puts away the toys. lost control of the situation. not like how you are behaving! child continues to disobey you. tations are not adhered to. will learn right from wrong. like the things that you like. shop, and buy what they like. per package 1987 Cadbury Schweppes Inc.
craft on this and other routes. the time of its greatest glory. in all Israel's wars since 1948. Latrun to Israel in 1948.
scheduled for the same time. Both Mr. Mendel and Mrs.
JCCampus Capital Campaign for this year. Major Gift8 c^ockui, Party fig^ Standin| is A. Kenneth Pincourt. qualify for the incentives program. no later than Super Sunday. March 20.
through to the winning side. give up or give in completely. Temples stood and fell in ruin? or nothing at all' approach. 14th anniversary of his death. from the practice of Judaism." come to witness it soon. yours. Yes, it burns forever. Dec. 14 Study Group: Lunch with the Bunch, 11 a.m.
will be "Making It Alone." the Palm Beach East Chapter. are welcome. Refreshments will be served. at Temple Beth Shalom, Lake Worth. Cantor Elaine Shapiro will present a Chanukah program. Monday, Dec. 14 at the Royal Palm Beach in Drexel Plaza. Challenger Club, Poinciana, Lake Worth. Anne Frank, sponsored by the American Savings Bank. | contact the JCC, 689-7700. Residents of the Joseph L.
| celebration. They will be enter-. after his Phantom jet crashed. with "this kind of terrorism,"
Now the community has something good to celebrate. (the) terror attack in Galilee." high alert for an IDF reprisal. and sea at any moment." light and freedom of the soul. They have a choice to make. Rosenbanm at the JCC, 689-7700. Dade Counties in her honor. Florida for the past 36 years. handling piovided you and Ihe consume! 10 a.m. to 12 noon at the JCC. tions and how to improve it. a hot kosher meal afterward. class starts every five weeks. Lunch Do you play Canasta? should arrive by 11:30 a.m.
information call Joan 478-2435 or Amy 684-8589. & N Seafood Grill (Palm Beach Lakes Blvd., west of 1-95). Gather at the Center (700 Spencer Dr. West Palm Beach) ? on Wednesday, Dec. 23, 7:30 p.m., to celebrate Chanukah. ? Come light the Menorah and share cookies and gifts. Dona- ? tion $2 plus one gag gift under $5. For additional informa- ? tion call Amy at 684-8589. ? Get together on Wednesday, Dec. 23 from 5-7 p.m. at ? Studebaker's (Congress and Forest Hill Blvd.) for Happy ? Hour. Donation $1 plus own fare and small entry fee. For ? more information call Susan 626-1320 or Marilyn 439-5524. ? Lawrence B. Katzen, M. D.
Largest Selection of Tee Shirts on the Beach! Have we got the shirts the kids want! See our half-price rack selected Items 50% OFF! ner was living in Damascus. and bigotry in their manv forms and guises. Prices effective Thurs.. Dec. 10 thru Wed..
Dec. 16. 1987. Quantity Rights reserved. dians Chapel. West Palm Beach. Security Plan Chapel, West. ilm Be-^ch. dian Chapel, West Palm Beacl. Abraham, 73, of West Palm Beach. and Fuenral Chapels, West Palm Beach. dian Chapel, West Palm Beach. Mitzvah of his son, Jonathan. funeral Dec. 1 at the temple. 33480. Phone 832-0804. Rabbi Joel Chazin. Cantor David Feuer." jL* Dec. 11 5:11 p.m.
morning from 9 a.m. to noon. vited. There is no charge. Dec. 14, 9 a.m. to 12 noon. services beginning at 7 p.m.
and many friends and family. the heart of Man. They are what makes us Jews. Kenneth J. Lassman. F.D.. General Manager Douglas Lazarus. F.D., V.P. Allan G. Brestin. F.D. Edward M. Dobin. F.D. God has ordained for them.